The blasphemy conviction of Meiliana, a 44-year-old ethnic Chinese Buddhist resident of Tanjung Balai, North Sumatra, for complaining about the volume of the adzan (call to prayer) has garnered worldwide attention and condemnation. But how exactly did the case unfold from a simple noise complaint to an 18-month prison sentence? Meiliana’s complaint was made on the morning of July 22, 2016 to her neighbor Kasini, who owned a stall near her house. Reports vary on what she actually said — her lawyers claim she merely remarked that the adzan broadcast from the nearby mosque was louder than it used to be, while the legal indictment says she asked Kasini, a Muslim, to tell the mosque caretakers to lower the volume as it hurt her ears. All parties agree, however, that Meiliana’s initial complaint was only to a single person. Over the next few days, however, her statement became distorted and rumors spread that a Chinese woman wanted to “ban the adzan”. On the evening of July 29, 2016, a small group of people, including a mosque staff member, went to Meiliana’s house to confirm the truth of her complaint. The group took offense at her statement, which they considered rude, and returned to the mosque. Meiliana’s husband Lian Tui went to the mosque to apologize but by then a mob had started to form. After the group’s confrontation with Meiliana, provocative messages spread like wildfire on social media and messaging applications, with some even claiming the woman had thrown rocks at the mosque and forcefully stopped prayers. Later that night, an angry mob started to gather in front of the local subdistrict office and went to Meiliana’s house to throw rocks at it. 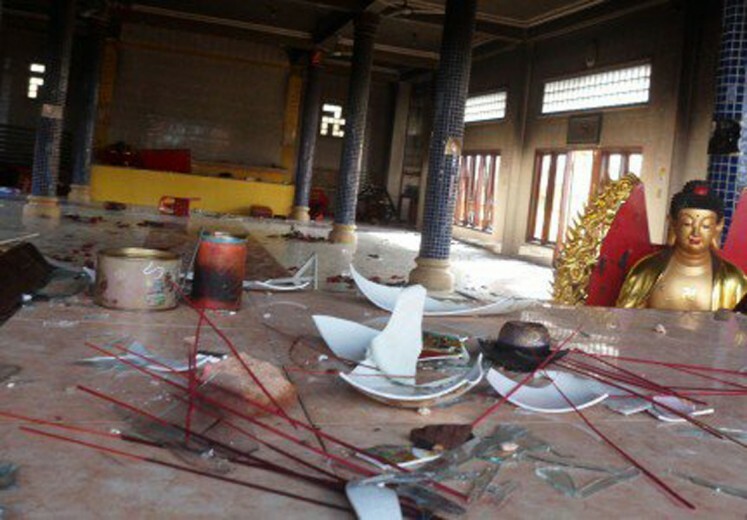 The violence then spread to nearby Buddhist temples. 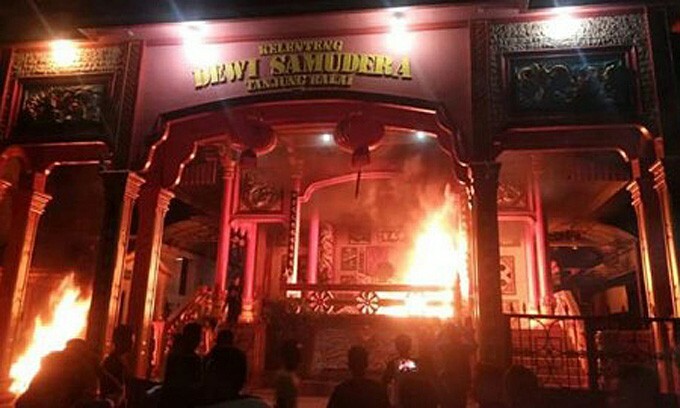 Fourteen Buddhist temples in Tanjung Balai were burned and ransacked by mobs between the night of July 29 and the morning of July 30, 2016. No fatalities were reported in the incident but damage ran into the billions of rupiah. Opinions differ on what caused a seemingly innocuous complaint to spiral into a violent riot. Ethnic Chinese business people said the social and economic gap between those of Chinese-descent and the non-Chinese people in Tanjung Balai was among the main reasons for the riot. Leo Lopulisa, a local fisheries businessman, said Chinese Indonesians in Tanjung Balai accounted for about 10 percent of the city's population of over 180,900. Of that figure, some 3 percent are categorized as very rich, while the rest are also in a comfortable financial condition. Muslim community leaders, on the other hand, blamed the riot on underlying tensions resulting from the construction of a six-meter-tall Buddha Amitabha statue on top of a Buddhist temple in the city. "The presence of the Buddha statue in Tanjung Balai is like a ticking time bomb, it can trigger a riot at any time. That's why it has to be taken down soon," Tanjungbalai Interfaith Communication Forum (FKUB) chairman Haidir Siregar said a month after the incident. Haidir said the majority of Muslims in Tanjung Balai could not accept the Buddha statue in their region because they considered the city to be Islamic. The statue was taken down in October 2016. The police arrested 19 people for their role in the riot. Eight were charged with looting, nine with malicious destruction of property and two with inciting violence. All were given one to four month jail sentences. The police themselves built a case against Meiliana based on a report filed by their own officer, Brig. Kuntoro. "How can we prove Meliana insulted a religion when nobody reported her to the police? To solve this problem, Brig. Kuntoro reported her," North Sumatra Police spokesperson Sr. Comr. Rina Sari Ginting said in 2016. Rina said Kuntoro had reason to report Meliana because he was at the scene when the mob argued with Meliana outside her house. Kuntoro came to the location at the request of the neighborhood head. Kuntoro’s report claimed that Meiliana’s complaint constituted an insult to Islam, based on the argument he witnessed between Meiliana and the mob outside her house on July 29. Police initially struggled to process the case against Meiliana, with expert witnesses saying that Meiliana’s statement contained no expression of hate. Soon after the riot on Aug. 9, 2016, Indonesian Ulema Council (MUI) chairman Ma'ruf Amin deplored the fact that local people chose to burn temples to express their anger against Meliana. He added that it was acceptable to lower the volume of loudspeakers if people in the neighborhood were bothered. "Although [Meiliana] expressed her complaint angrily, such an act should not be replied to with anger. Both parties should sit together to discuss her concerns," Ma'ruf said. However, in January 2017, the North Sumatra chapter of the Indonesian Ulema Council issued a fatwa declaring that Meiliana’s complaint was “demeaning and insulting towards Islam” because the adzan was part of Islamic law. Based on the fatwa, police charged Meiliana with blasphemy that same month, but she reportedly disappeared until she was finally arrested on May 30 this year. 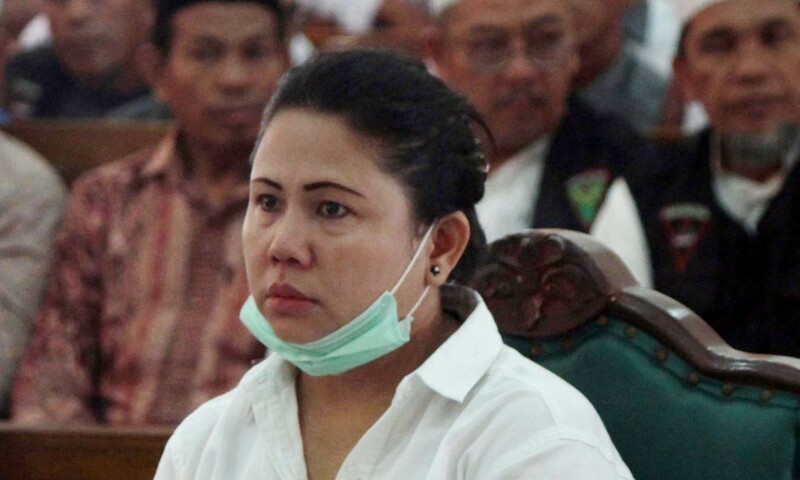 Meiliana’s blasphemy trial started on June 26 this year and later on Aug. 13 the prosecutors demanded that she be found guilty as stipulated in articles 156 and 156a of the Criminal Code, and be sentenced to 1.5 years in prison. Meiliana’s lawyer, Ranto Sibarani, denied the prosecution’s claims, saying that the blasphemy charges against his client were based on hearsay and that no one had directly heard her say all the words she was accused of saying. The mother of four was nevertheless found guilty by the Medan District Court on Tuesday and sentenced to 18 months imprisonment. Her legal team has said that they would appeal the verdict. Meiliana’s conviction has drawn widespread criticism from domestic and international rights groups and two of Indonesia’s largest Islamic mass organizations. Executives from Nahdlatul Ulama (NU) and Muhammadiyah also denounced the verdict, with NU legal division head Robikin Emhas saying that Meiliana’s statement did not constitute blasphemy. Muhammadiyah secretary Abdul Mu’ti agreed and said there should be an in-depth study to review the blasphemy-related articles and laws, arguing that the provisions were vague and open to subjective interpretation. Anti Discrimination Movement (Gandi) said on Thursday that Meiliana’s statement was similar to what Vice President Jusuf Kalla said in 2015. Kalla, also the chairman of the Indonesian Mosque Council (DMI), criticized the overuse of mosque loudspeakers during Ramadhan that year. Therefore, the North Sumatra’s MUI should review their fatwa, said Gandi’s secretary general, Ahmad Ari Masyhuri, who is also the chairman of NU’s Quran reciters association. A petition asking President Joko “Jokowi” Widodo to free Meiliana started on Change.org on Wednesday has since garnered over 30,000 signatures.